Oura Cathedral, a Roman Catholic church in the Oura Foreign Settlement in Nagasaki. Oura Cathedral was the second Catholic church built in Japan after Japan opened its doors in 1853. 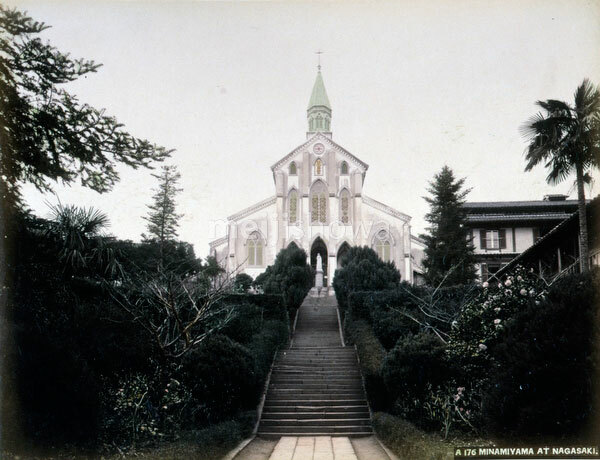 The original church was finished in 1864, the building on this image was completed in 1879 (Meiji 12). The church became world famous after Kakure Kirishitan (Hidden Christians who survived hundreds of years of persecution) approached French priest Bernard-Thadée Petitjean here on March 17, 1865. The church still stands; it is Japan’s oldest existing wooden church.